In order to reward our customers, wehrmacht.es launches a loyalty points program that transform into euros discount. 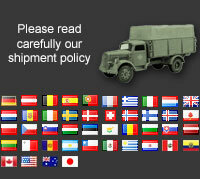 For each purchase you make on our website, we will compensate you with points. Each 1 € purchase on our website is automatically transformed into 1 point valued at 0.02 €. For example for every purchase you make from € 100 reward you with 100 points, with a final value of 2€ discount for the next purchase. It is a linear 2% discount on any product purchased. No minimum or maximum purchase. How I can get points? When making your first purchase at wehrmacht.es you create an account on our website where you will see at all times the points you have. Points accumulated from your first purchase and exchange them for money off your next purchase, when you want and how you want. It is easy and fast, you just have to place an order on our website and begin to enjoy the discounts. How do I know the points I have? You can check your points easily from your customer account. Access your private customer area at any time and see the points you have and the cash value thereof. In addition, each time you finish an order, we'll show you accumulate points with each purchase. Yes. All accumulated points expire after one year if any achieved, ie if you place an order on February 5, will have to place another order before the same date the following year to enjoy the discount. How long does the loyalty points program? The program wehrmacht.es loyalty points set out indefinitely, with no end date. Can I collect points obtained with different customer accounts? No. You can only spend the points you have in your own customer account. Personal and non-transferable. Can I cancel my data within the loyalty program? You can cancel your subscription whenever you want, without any commitment. Entering your customer account and Unsubscribing your user within our website. In any case you can contact us contacto@wehrmacht.es to deregister your data at any time. Note: You will lose all accumulated points so far, and will not be recoverable if you ever signing up later.